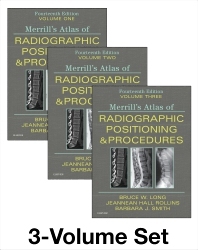 The gold-standard in imaging, Merrill's Atlas of Radiographic Positioning and Procedures, 14th Edition, is revised to fit the image of the modern curriculum. This thoroughly updated text has been reorganized to emphasize all procedures found on the ARRT Radiography Exam and in the ASRT Radiography curriculum. Separate chapters for each bone group and organ system enables you to learn cross-section anatomy along with anatomical anatomy - helping you make more accurate diagnoses. All outdated material has been removed and specialized content has been updated and moved to chapters more relevant to modern practice. With more than 400 projections, Merrill’s is not just the most widely used imaging text, but the most comprehensive radiographic positioning product on the market!